Cars Leave their staging area at 11:45 Sharp. Click here for a link to the parade map. The Tom Stewart Memorial Classic Car Show & Parade is an all-day event on Festival Sunday. It consists of a car parade through town to the announcers’ stand for a formal car and driver introduction followed by parking in town for spectator viewing and judging. Participants will be classified and judged within nine prize winning categories. 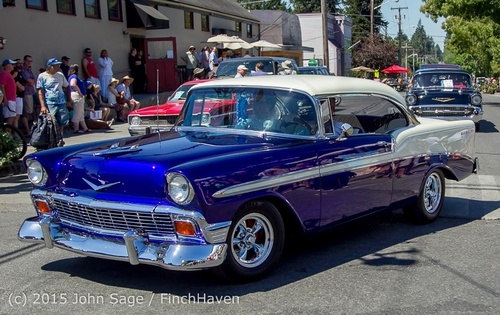 So, put July 21rd on your calendar for great festival fun and your participation in the Tom Stewart Memorial Classic Car Show and Parade...you’ll be glad you did! Car and drivers check in begins at 8:00 am, Sunday morning, July 21rd . Complementary coffee, beverage and pastries provided. Early arrival recommended...check ferry schedules. Voting & judging prior to parade. Enter at the north end of parking lot off of Cemetery Road.